Last month, American Airlines and United joined Delta in offering passengers a Basic Economy fare. Some critics are understandably referring to this as an ‘economy minus’ fare. In an age of budget airlines and pared-back service, the packages offered by legacy airlines such as American Airlines and United were luxurious by contrast. 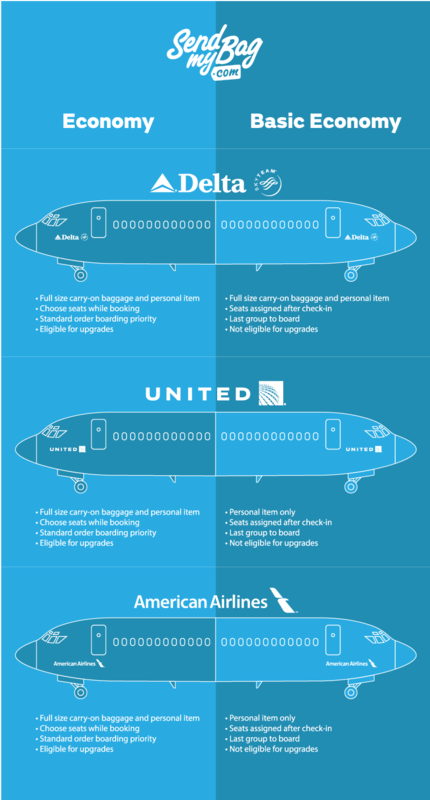 By adopting the Basic Economy fare it seems like these companies are headed in the same direction as the no-frills airlines – charging for anything but the bare minimum in order to boost profit margins. As illustrated below, passengers travelling on Basic Economy fares are not able to select their seat, they are the last to board the plane, and are not be eligible for upgrades. The worst aspect of the new Basic Economy fare, however, must be the restrictions on baggage imposed by American Airlines and United. We have all gotten used to airlines charging for checked baggage but eliminating the overhead allowance marks a new departure for these legacy airlines. United and American Airlines passengers travelling on Basic Economy fares are not allowed to use the overhead lockers and so may only bring one small personal item on board with them, that fits under the seat in front. This means that passengers are restricted to only the bare minimum of luggage – scarcely enough for a day trip and no chance of bringing home any purchases or other additional luggage whatsoever. It can, of course, be argued that cheaper Basic Economy fares make travelling by air more accessible to people of all incomes, but this is really a false economy as these passengers will have to fork out extra to bring any form of luggage beyond a handbag or a laptop. What the new Basic Economy fare confirms is that airlines just don’t want our luggage. So why not try Send My Bag’s luggage delivery service and have as much baggage with you at your destination as you wish? With Send My Bag you can send your luggage between numerous destinations across the world, meaning that you can go for the low-cost Basic Economy seats if you wish, while also escaping the hassle of dragging suitcases onto public transport or waiting around for your bags at luggage carousels. Why not give yourself the luxury of your luggage and a baggage-free journey? Read our ‘How it Works’ page to find out more! Wondering why you should be living in Portugal? Thinking of moving there but need a little more convincing? Or perhaps you are choosing your place in the sun and need some inspiration? Send My Bag is here to help with its top ten reasons to move to Portugal.